Party? T-Rex? Party! T-Rex! 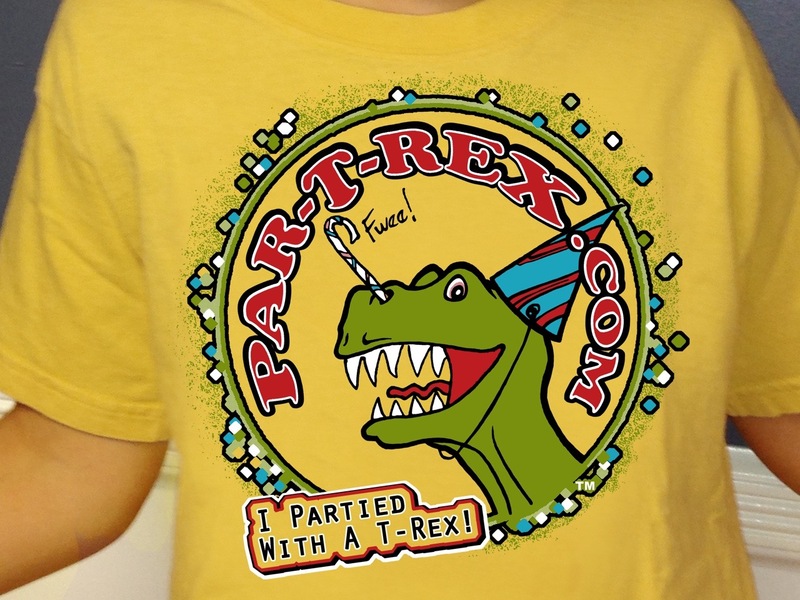 Par-T-Rex for your next party! It's what every party needs, a T-Rex!! 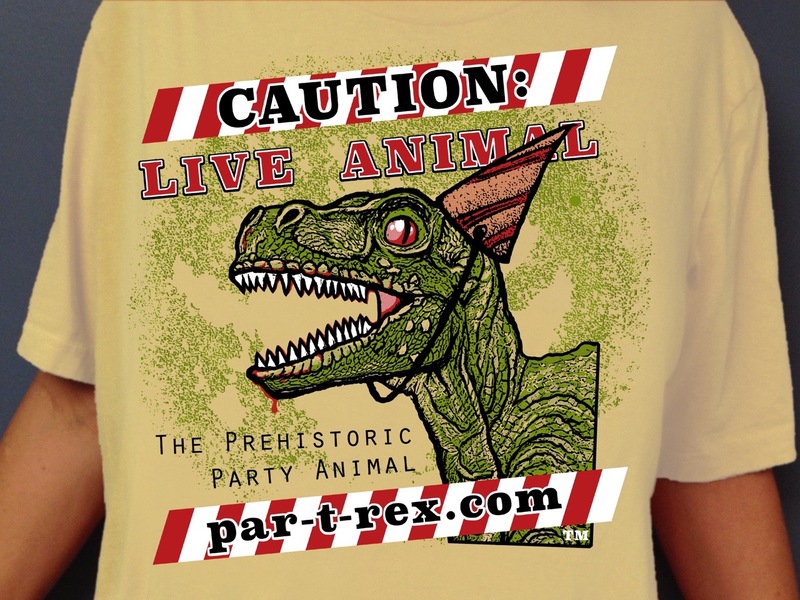 Stan, the Par-T-Rex, is ready to come to your party. He's over 7 feet tall and 13 feet long. Stan is a walking, roaring, breathing, interacting marvel straight from the Jurassic Age. He can be as gentle or as scary as you need. Just tell our dinosaur trainers what you want! He can be as gentle as you need to intrigue and delight 3 year olds. Or, he can be scary for older kids looking for a thrill with their dinosaur experience. Stan has a few tricks up his tiny tiny sleeves with games and activities including Throw the Hoop on Stan's Tail and So You Think You Can Outrun A Dinosaur! Don't forget the Dinosaur Conga! Want to make the kids squeal with glee? Ask for the Hand Chomp! Thrills for all. But you never need to worry about safety with Stan because he is always accompanied by his handler! Meg The Dinosaur Handler has 16 years experience controlling the big guy! Nixon is our youngest dinosaur handler who sometimes comes along to lend a hand. Kids' birthday parties are more fun with a dinosaur stomping around! Office pranks are easy and fun when there's a dinosaur around the corner! Honestly, any party becomes an event whenever Stan shows up! Party cost. 50% off! Only $300 for an appearance within 20 miles North, South, or West of Stan's home, Verona NJ. Within 30 miles North, South, or West add $50. Within 40 miles North, South, or West add $100. Beyond that, give us a jingle, we'll try to work something out! Every appearance includes a Tee-shirt of your choice and size. Additional party favors: Extra Tee-Shirts! All the colors are so fun, it's like candy. Candy you can wear! Dino Tails! They also come in random multi-colors. Everyone can be a dinosaur! Give us a shout and we'll give you a roar! We took Stan to Upper Montclair today. It was beautiful out! 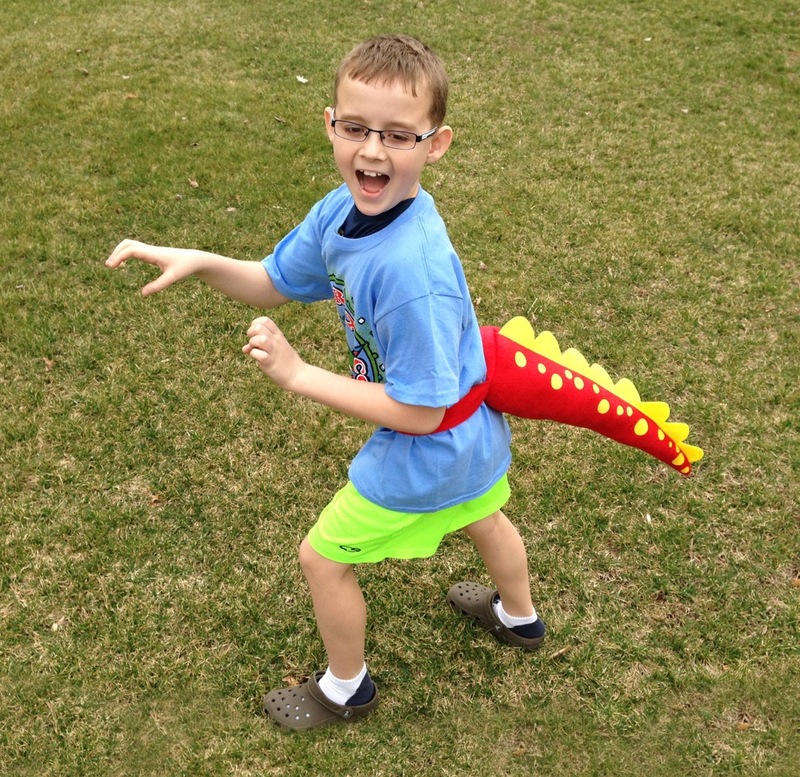 It was so nice out today that we took Stan, the Par-T-Rex, to the park for some exercise. He loves meeting kids everywhere he goes. One free with each party order! Get extras for your guests! $15 each. 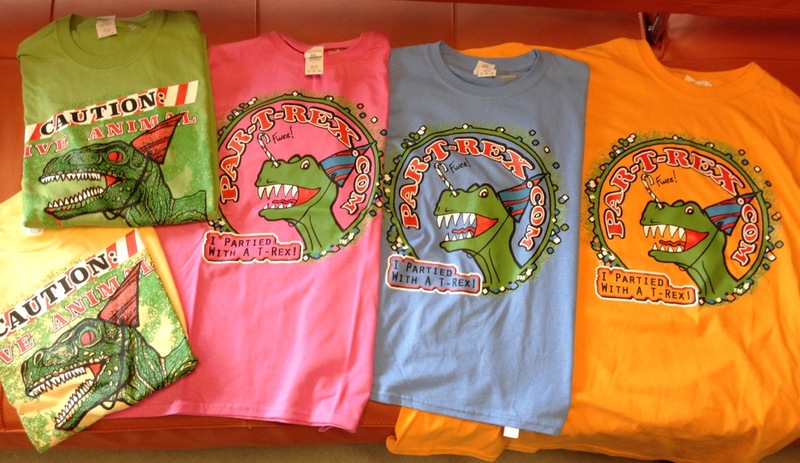 Sizes: Youth Small, Youth Medium, Youth Large, Adult Small, Adult Medium, Adult Large, Adult X-Large. Colors: Sand, Blue, Green and Light Yellow. Plush multi-colored dino tail! Don't just play with Stan, be Stan with your very own tail! $10 each. I had nothing planned, but then I found this! Then a dinosaur showed up! Sweet! I hated party planning until I discovered this! I mean, I still hate party planning, but now I have a party planned! 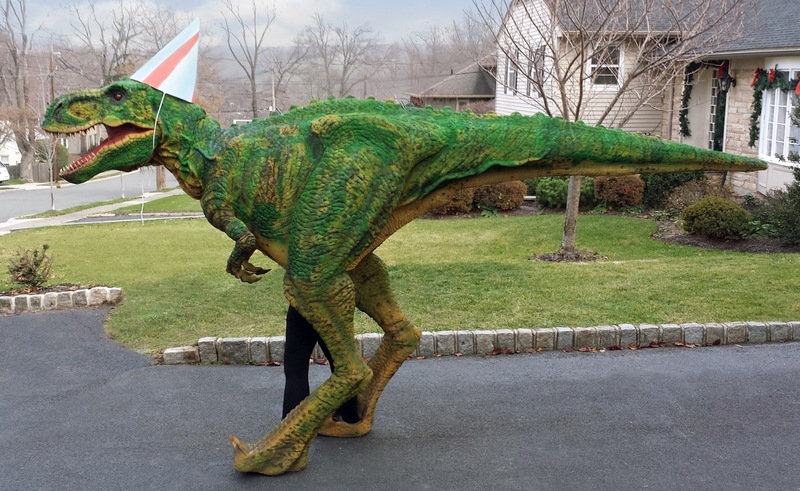 It's a freakin' dinosaur costume!